Baltimore’s Federal Hill neighborhood, with its intriguing history and antiquated 19th century brick homes, is a wonderful setting to start off your Baltimore wedding photography shoot. Grab some lunch or some colorful drinks at one of the neighborhood’s popular restaurants while your wedding photographer documents the occasion. Walk arm-in-arm with your bridal party down the brick-paved sidewalks, taking time to pose for fun pictures in between window-shopping. The neighborhood’s eponymous park, Federal Hill Park, overlooks the shining city and the gorgeous Inner Harbor, providing a wealth of panoramic photo opportunities. For a truly romantic and memorable image, get a shot of the bride and groom kissing on a bench with the harbor sprawling out behind them. The lush hillside also encourages group photos with a vivid green backdrop. Get creative by incorporating the imposing black cannons in some of your shots as well, staging funny pictures of the bridal couple or somber shots of the bridal party that your photographer can later print in sepia for an antique effect. Complete your Baltimore wedding photography session at the American Visionary Art Museum, which sits right beside Federal Hill Park. For artsy couples, this museum provides the ideal backdrop for visually interesting photographs. The museum is home to independent artists and as such, the building’s architecture is incredibly unique and its façade is decorated with various art installations. The reflective outer walls make a great background for group shots of you and your wedding party and you and your future-spouse can take your time posing for shots in front of one of the current outdoor exhibitions. This itinerary is sure to leave your wedding album brimming with magnificent shots. For chic brides and grooms with an eye for sophistication, the Mount Vernon Square neighborhood in Baltimore will stand out amongst other Baltimore wedding photography locations. Surrounding a pristine central park, stylish 19th century row houses nestle in beside stately, opulent houses with colorful histories. Bring your bridal party to this neighborhood and have your photographer snap artistic shots of everyone dressed to the nines in front of the palatial buildings. One building you can not miss, standing proudly on the border of Mount Vernon Square, is the Mount Vernon United Methodist Church. This Gothic stone church has stunning architectural elements, like pointed arches, stained glass windows, and ornamented spires, which will translate beautifully to film. The color of your bridesmaid’s dresses will pop against the deep gray and taupe outer walls of the church. Take pictures of your bridesmaids and groomsmen on the steps leading up to the three entrances, or capture a romantic shot of the bridal couple kissing in front of the middle door. The Mount Vernon Square Park and the Washington Monument sit in the middle of this classy neighborhood, beckoning you and your group to continue shooting in its cool, grassy spaces. Pose in the park with the monument rising up tall in the background, or have your bridal party fan out around the refreshing, running fountain right in front of the monument. Allow your photographer to catch some fun, journalistic shots as you let loose and play around in the square with your party and your future-spouse. The fun times will be written all over everyone’s faces and you will help you to remember your day forever. The Greek Orthodox Cathedral of the Annunciation is perhaps one of the most intricately styled buildings in the Baltimore area. 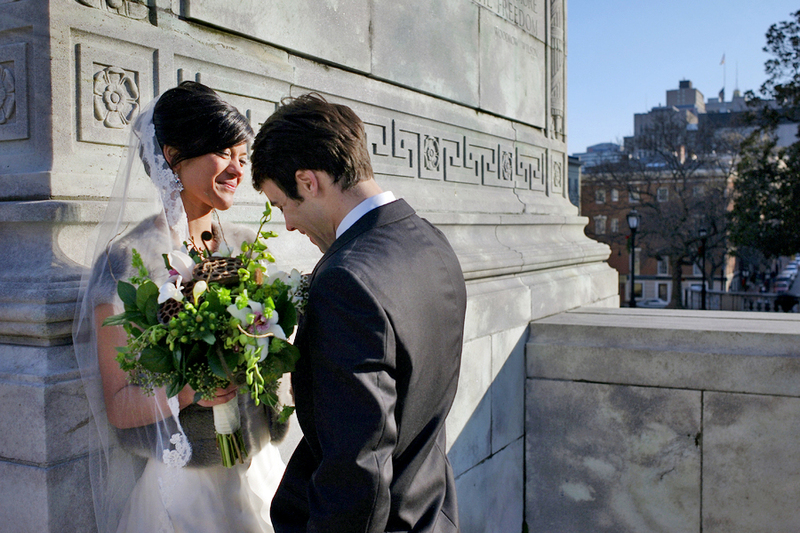 The church’s columns and arches decorate the elaborately ornamented circular building, providing you and your wedding photographer with a great background for your Baltimore wedding photography. Have the groom scoop up the bride in front of the historic cathedral, or line up the bridesmaids and the groomsmen on either side of the couple to get some fantastic symmetrical shots. Whatever religion you practice, the cathedral will add a stunning dramatic flare to your compositions. Right nearby the cathedral sits another one of Baltimore’s architectural gems, Mount Royal Station. Previously a working train station, this location is now a part of the Maryland Institute College of Art and offers a wide range of beautiful pictures to take with your wedding party. The building’s light gray tones and carved windows make for pretty backdrops for your shots, and the towering clock turret in the middle can add a dramatic elegance to your photos. The train shed and tracks are still actively used by CSX, so train-enthusiasts may be lucky enough to get some shots while a train roars underneath them. In addition to the Mount Royal Station, the campus of the Maryland Institute College of Art is filled with other great places for your Baltimore wedding photography. Bridal couple portraits and full wedding party shots will look great staged against the varied buildings and shaded green expanses. From the Gateway building’s rounded, contemporary architecture to the classically-built, white Main Building, roam around the campus with your wedding party and your photographer to find the perfect pictures to round out your wedding album. When all is said and done, these locations will give your photographer plenty of opportunity to capture awe-inspiring images to remind you of your special day.